Prominent political activist Ahmed Douma remains in Qasr El-Aini hospital on Thursday after being admitted earlier this week. Security officials told CBC TV channel that Douma was going to be transferred to a private hospital on Wednesday but according to his wife Nourhan Hafzy he is still in the state-run Qasr El-Aini hospital. Douma, who is serving a three-year sentence for breaking the protest law last November, was admitted to the hospital on Saturday after repeated requests from him to receive urgent treatment for a kidney condition. 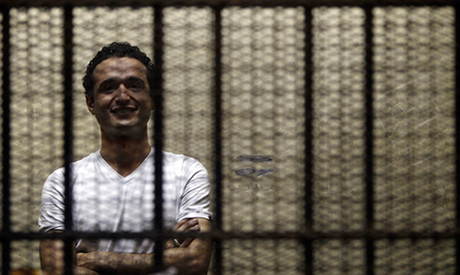 Two weeks ago, Douma underwent tests at the hospital before being transferred back to prison. Douma, who was on a hunger strike for a month, suffers from dangerously low levels of potassium, Hafzy said. Hafzy said she had not been allowed to visit her spiuse in hospital or speak to the doctors treating him. "I do not know anything about Ahmed since he was admitted to hospital," Hafzy said on her Facebook account earlier Thursday. Douma was among a number of prominent political detainees who started a hunger strike last month to demand their release and the abrogation of the protest law. Among other prominent detainees who are on hunger strike is Mohamed Soltan, who was also transferred to Qasr El-Aini hospital after his health deteriorated following nearly 256 days without eating. Douma was convicted of breaking the protest law and attacking security forces, along with April 6 Youth Movement co-founders Ahmed Maher and Mohamed Adel. He is also standing in another trial alongside more than 150 others over clashes with security forces at the cabinet building in December 2011. This trial will resume on Saturday.